Overhang and "did I do that?". I drove straight trucks and box trucks for 9 years before getting my CDL. You do have to be aware of your overhang but you would have to be pretty close to someone before it would hit. Being a straight truck you always have visibility of both sides of your truck so just go slow and watch your mirrors in a tight turn. I prefer paper logs even though I run no more than I would on electronic logs I use them to drive or sleep when I feel. You might say I'm cheating but really I'm driving when I'm rested and sleeping when I'm tired. I remember running elogs and having to stop at 2 in the afternoon and couldn't sleep, then have to start my new day at midnight when I'm so tired. There's a small closet area where you can hang up shirts and such. Also other cabinets for food, more clothes or whatever. I use the upper bunk for storage as well. The bottom bunk lifts up for more storage space as well. You tube has some good videos of truck tours that show sleepers in detail. Check out IITR in Clackamas Oregon. They have a weekend class, 10 weekends and DMV tester comes to the school for CDL test. Cost about $5000. I did the weekend class almost 5 years ago so price may be different now. Anyway I had a great experience and would do it all over again. Union Pacific railyards Portland and Seattle have blindsided 45s as well. I've seen drivers bump containers as they back in. I have a confession, even with all the warnings I bought a truck and am leased on to an intermodal company. I have an older Volvo with over 500k miles on it now. I don't have a fancy new truck, as a matter of fact I don't like the color at all (Penske Yellow). I have no warranty and will be responsible for any maintenance and repairs. 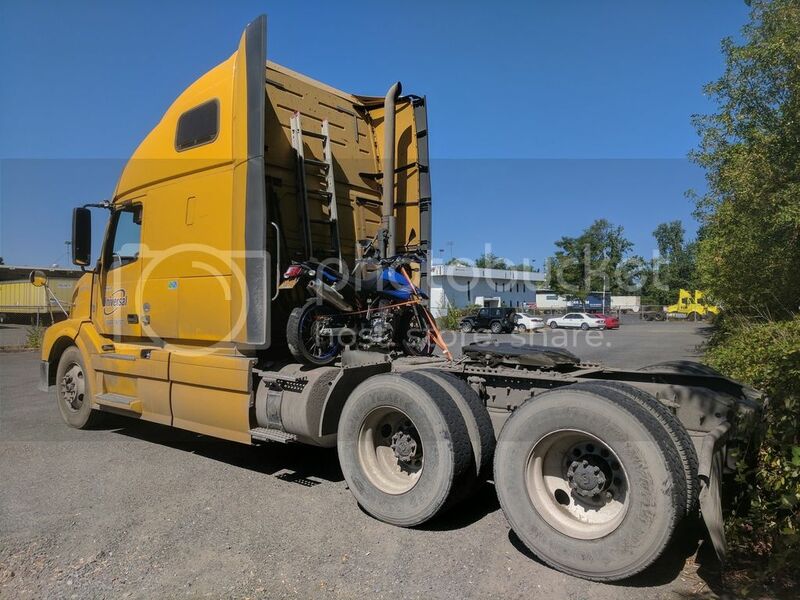 I'm leased on to an all owner operator company and it is common to see a driver wrenching on his truck in the yard, as I have myself done minor repairs. The purchase of my truck is completely separate than the company I'm leased to (I have a loan with a finance company). I'm brand new to owning a truck only been 4 months now but at the end of the year I'll talk about my numbers good or bad. I'm doing Intermodal and see a lot of Swift containers at the rail yards. Might be something to look into. I'm mostly local, have weekends off and make more than I made OTR with Prime. There's some guys driving daycabs where I work that are home every night. I prefer longer loads so I spend a couple nights a week in the truck. A long load in intermodal is 300-600 miles. I don't know your whole situation but it's worth looking into. Good luck what ever you decide. Crash the gate doing 98, let them truckers roll 10-4. Funny story, it's cool to hear how drivers get out of situations. Thanks for sharing. In my opinion it's to expensive to lease a brand new truck. I think buying an older truck on your own and working for a company is the better choice between the two. Keep in mind an older truck most likely won't be under warranty and repairs come out of your pocket. But a brand new truck will be close to $1000 a week or you can get a decent used truck for $1000 a month. Say you put the difference of $3000 a month in the bank to handle repairs, in just a few months you'll have a pretty good amount. If you happen to have no major breakdowns you will be in good shape to upgrade to a newer truck at some point if that is your goal. Most owner operator companies require experience, which is definitely in your best interest anyway. Start out as a company driver for sure as a new driver starting out. Ever try backing up a short trailer after years of pulling 53 footers, I look like I should be riding the short bus if you saw me back this up for the first time. It turns so fast! Having trouble posting the picture, hope this link even works. A Regular GPS or a Tablet? I use both, Rand McNally and I have a mini iPad on a mount that I use for birds eye view in addition to the GPS. I first started with the GPS and added the tablet later on. I am a rest area attendant. Ask me anything. One of the things I'll miss about being on paper logs is being able to park at a truck stop or Walmart 5-10 miles from my delivery. I can drive there without starting my clock and sleep near food and bathrooms rather than outside the receivers gate on the street with no services. Just to deliver without starting my 14. And I must say that the guys who do it nowadays on elogs are even crazier than guys like myself who did it with paper logs. I could cheat all I wanted to on paper, which for me meant I could drive whenever I wanted to and sleep whenever I wanted to. I didn't have to keep pushing through for super long stretches at a time like guys have to nowadays. I would give anything to eliminate that stupid 14 hour rule. I still can't believe they ever created it, and I'm even more appalled that it still exists today. I thought for sure they'd come to their senses and realize you shouldn't make someone cram all of their work into one super long stretch like that. So kudos to all of you pushing 3,000 miles a week on elogs with that awful 14 hour rule. It really is impressive. If you ever drove I-5 in Oregon mile 192, you can add Springfield Oregon to the list! I'm somewhat in your neighborhood, staying in Oakland CA tonight. Tough to cross paths with you these days. I'm doing intermodal now, mostly Oregon and Washington. Glad to see you back here at TT. Chris I'm happy to see you're still alive. Long time no see my good friend! Just wanted to throw it out there, when I was working for Sygma Network a food service delivery company. They put their drivers up in hotels while on layover routes. I stayed at Shilo inn, Best Western plus, Guest House and other decent hotels. I thought they were pretty nice. Decent money and had 2 days off a week and did one layover at home. It is hard work however, all hand truck deliveries. Also in the winter they expect you to chain up and drive if necessary. Not every trucking job requires you sleep in a truck. I continue to get emails from Sygma to come back, but I like what I'm doing now even though I'm sleeping in a truck tonight in a drop yard with no services. I'm on paper logs and occasionally I will do what is considered cheating, but not to run like a crazy person but just the opposite. For example, I'll stop to sleep during 0100-0400 when my body naturally wants to sleep. Then start up again but technically my 14 would be done and I haven't gotten a full break. This in my opinion is much safer then when I was on electronic logs and was forced to push through the night. I'll take another nap later in the day while being unloaded. I know this will soon be a thing of the past and I will again be on elogs again. I still make decent money on elogs but will be forced to having to stop for a 10 hour break in the middle of the day occasionally when I'm not able to sleep, then run through the night after the sleepless daytime break. If I had that scale ticket I would have slid my fifth wheel up and ran with it. I wouldn't bother to reweigh. The couple local jobs I've had were slip seat trucks. Many times you can smell the last drivers funk. They probably sneezing and coughing all over the dash all shift. As an OTR driver you get an assigned truck that nobody else enters. Just thought I'd point out that slip seat trucks can be pretty nasty. Some drivers probably relieving themselves right there in the drivers seat into a Gatorade bottle. Think about that as your eating your lunch in the truck to avoid the restaurant. No disrespect to local drivers as I've been there done that, you just can't control who drives the rig before you. I agree with 6 String on this, very annoying.